As we enjoy our all-American traditions of cook-outs and fireworks this July 4th, let’s remember the never-ending price of our nation’s 231-year commitment to freedom. Let’s take a few extra seconds to smile at our flag and offer a prayer of thanks for our veterans and members of the U.S. Armed Forces who committed their lives to protecting what our flag represents: the freedom for which our founders fought to establish our great nation. Thomas Jefferson drafted the Declaration of Independence on a “laptop,” a small portable wooden writing desk/case that fit on one’s lap. We celebrate our independence on July 4th because that’s the first day anyone signed the actual Declaration of Independence document. Only two signed the Declaration on July 4th: John Hancock (he signed first, and not in a “big-size” signature) and Charles Thompson, secretary of the Congress. Most signers of the Declaration of Independence actually put their “John Hancocks” on the document a month later on August 2, 1776. The printed version of the signed Declaration of Independence was called the “Dunlap Broadside”; 200 copies were made, but only 27 are accounted for today. One of these rare, original copies of the Declaration of Independence was found inconspicuously in the back of picture frame at a tag sale. It was later sold at auction to television producer Norman Lear in 2000 for $8.14 million. Lyn and Norman Lear desired to bring “the people’s document” directly to the American people. On July 4, 2001, the Declaration of Independence Road Trip launched as a tour whose mission was to engage and energize all Americans, particularly young people, by bringing this rare copy of nothing less than the nation’s birth certificate to them in cities and towns across the country over a span of 3 years. The first newspaper to print the Declaration of Independence was the Pennsylvania Evening Post. The first fireworks used to celebrate the Fourth of July were ignited in 1777 to commemorate the first anniversary of the American colonies’ Declaration of Independence. 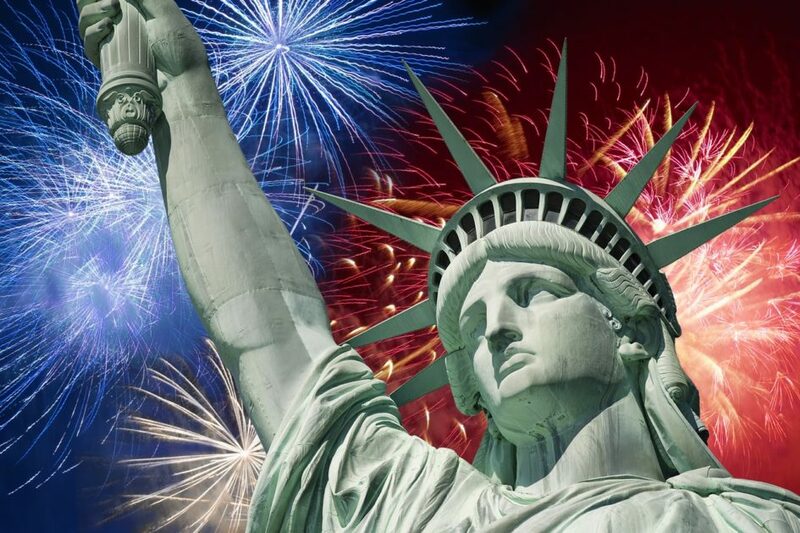 Today, the largest July 4th fireworks display takes place in New York City. The first president to hold a Fourth of July celebration at the White House was the Declaration of Independence primary author: Thomas Jefferson. Three of the first five U.S. presidents died on the Fourth of July: John Adams, Thomas Jefferson and James Monroe all died on Independence Day. And in the most extraordinary coincidences in history, the two giants of the declaration, John Adams and Thomas Jefferson, both died on July 4, 1826 – the 50th anniversary of the adoption of the declaration. Jefferson died first, in Virginia, and Adams hours later in Massachusetts. President Calvin Coolidge, the 30th president of the U.S., was born on the Fourth of July in 1872. The Liberty Bell actually had nothing to do with declaring independence in 1776. While there is evidence that the bell rang to mark the Stamp Act tax and its repeal, there is no evidence that the bell rang on July 4 or July 8, 1776 – the date the Declaration was first publicly read aloud. (Remember, most people then were illiterate, “news” came via “public readings”.) It wasn’t even called the “Liberty Bell” until the 1830s. It was originally the “State House bell”, which lofted in 1751 and rang in the tower of the original Pennsylvania State House which today is called “Independence Hall”. The Liberty Bell’s timeless inscription is from Leviticus 25:10: “Proclaim Liberty Throughout All the Land Unto All the Inhabitants thereof”. It’s believed Speaker of the Pennsylvania Assembly Isaac Norris chose this inscription for the State House bell in 1751 to commemorate the 50th anniversary of William Penn’s 1701 Charter of Privileges which granted religious liberties and political self-government to the people of Pennsylvania. The inscription of liberty on the State House bell, now known as the Liberty Bell, went relatively unnoticed during the Revolutionary War. Its symbolic meaning widely grew as a union rallying icon as the Civil War threatened our young nation. Sometime in the early 1840’s, after nearly 90 years of hard use, the bell cracked. In 1846, metal workers widened the thin crack to prevent its farther spread and restore the tone of the bell; the wide “crack” in the Liberty Bell is actually the repair job. But, the repair was not successful, and a second crack developed, running from the abbreviation for “Philadelphia” up through the word “Liberty”, silencing the bell forever. No one living today has heard the bell ring freely with its clapper, but the bell is “gently tapped” on rare special occasions. In 1870, Congress established July 4th as the federal holiday Independence Day; in 1941, the Fourth of July became a paid federal holiday. The bombardment of July 4th furniture and appliance sales came afterwards.